Blog - Ellis Island ATB, Available Now! ***UPDATE 9/6/17 - We began offering the Ellis Island ATBs for pre-order in late July and the response has been overwhelming! We knew that the limited mintage of 20,000 and the historical significance of Ellis Island meant this would be a popular issue, and the U.S. Mint sold out even before the official release date of the coins! No more of these coins are expected to be minted at this time. With precious metals prices rising, it's important to lock these down before prices and premiums move higher. The U.S. Mint has been offering five oz silver America the Beautiful coins since 2010. Each year, five new issues are released, and the series has become extremely popular. 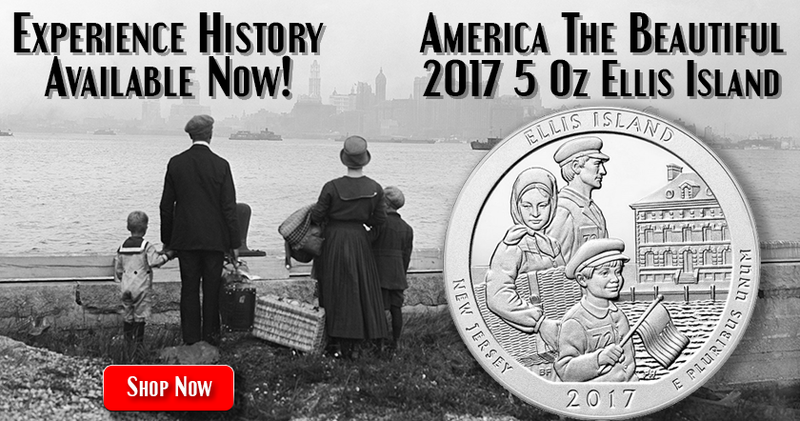 The upcoming release is the fourth of this year, the 2017 5 oz .999 silver Ellis Island America the Beautiful coin. This release is highly anticipated due to its historical significance, and wholesalers around the country are already sold out, even before it is officially released! We are offering a limited quantity of the Ellis Island ATB while they remain in stock. It is important to note that while the America the Beautiful series has been produced for the last seven years, the mintage numbers of each release are different. The year with the highest mintage was 2011, when 465,100 five oz ATBs were sold. This year, the combined sales of the first three releases: the Effigy Mounds ATB, Frederick Douglass ATB, and Ozark Riverways ATB, are only 75,000 combined. 2017 is on pace to have the lowest total mintage ever of the ATB series, even though the series is more popular than ever. The Ellis Island ATB is slated for a mintage of roughly 20,000, and as I mentioned earlier, is already sold out through major distributors. We expect premiums to rise dramatically in the coming months on the Ellis Island ATB. With the U.S. Mint likely not producing more coins and demand growing larger, some dealers have already raised their prices almost $20.00 per coin! Here at Monument Metals, we pride ourselves in offering our clients as many advantages as we can. We were fortunate to reserve a group of the Ellis Island ATBs early, before premiums went higher. We want to pass the savings on to you. At Monument Metals, we give our clients a discount when there is one to be had. 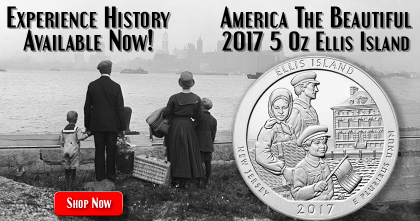 We are offering a 2017 5 oz .999 silver Ellis Island America the Beautiful coins at what we believe are the lowest prices online. Take advantage of this opportunity while supplies last and before premiums move even higher!